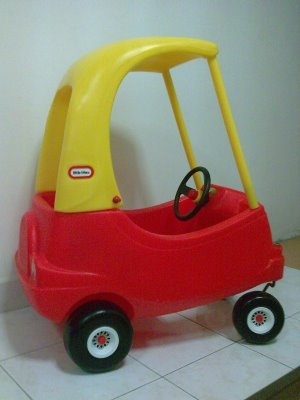 As a toddler, my son loved his Little Tykes red coupé. Every day we would spend hours playing gas station. The driver would Fred-Flintstone it around the house and then, pull-up to the Little Tikes gas pump. There, the lady attendant pumped his gas and he paid her in change from daddy’s jar. With receipt in hand, he would drive around once more only to return for another fill-up. One spring day, the attendant was in need of a break. With a destination in mind, she made a plan. The only problem was hubby had the only vehicle. And so, she looked around and spied the Dairy Queen one block over. At 2 pm, the parking lot was empty. An idea formed. With coupé and boy in hand, she took the back street to her destination. Once they reached the parking lot, she pulled to the drive-in window and ordered a dog, fry-bite, and a coke. She pulled to the pay window and gave the lady her money while all the other attendants smiled at the grinning tyke in the driver’s seat. Then a car pulled behind them, then another, then another. Sigh. The minutes began to creep as she waited. Her prayers were answered when finally, the food arrived. Now dreading the return trip, the “engine” sputtered. She couldn’t take the main road. Too much traffic. Determined it wasn’t about her, she turned the coupé around and rolled past the waiting cars. She smiled when the happy little tyke waved to each car and they returned the gesture. Why did she do such a silly thing? Because she loved the boy that much, and because memories are a powerful thing. They connect us. They often sustain us in hard times. While on their way to Canaan, Moses reminded the people what God had done for them. Just before his death, God gave Moses a song to teach the people so they wouldn’t forget. In Psalms 63:2, David cries, “To see thy power and thy glory, so as I have seen thee in the sanctuary.” His soul was cast down in the wilderness. Yet, he recalled the sanctuary. He went on to proclaim that God’s lovingkindness is better than life. Yes, memories are a powerful thing. They stand as memorials and testimonies to others. My son remembers that day as a three-year-old he “drove” to the Dairy Queen. Some may have their doubts. But for a mom who, as a three-year-old, also has memories of swallowing a penny and the hoopla that took place afterward, I believe him. Memories can also be debilitating. They can hold us captive. Yet, God, through the work of His Son, has given us the ability to gain freedom. Today, I pray, if you are in a tough place, Beloved, remember from whence you came. Recall the times, God has delivered you. Write it down and make a new memory today. For you who struggle with memories. You are not defined by those memories. Don’t let the enemy dictate your future. Seize the promises of God. Know someone is praying for you. There is hope in Christ. Make new memories with those who love you. Lord, for the child that needs a reminder today, I pray. Let them recall Your goodness. Let Your love, better than wine, wash over them. Put a song in their mouth to stir up the memories of Your faithfulness in times past. Let your peace that passes earthly understanding envelope them. Let them dance in joy. For the child who needs to forget. It is by our Redeemer’s stripes we are healed. Touch the wound. Pour in the oil and wine. The chastisement of our peace was upon His back. You have promised to heal the wounds and restore health. Let them forget their misery, and only remember it as waters gone by. You alone can do the impossible. Speak the Word and it shall be done. In Jesus’ name, I pray. If good memories come about, maybe its God’s way of telling you – heaven will be more of the same joy to come. Hi, Cathy B! Thank’s for stopping by CHW. I agree with you. Good memories serve to remind us that heaven will be worth it all. Happy weekend!